IISER has released the IAT Result 2018 on 7 July in online mode. A link to check IISER result 2018 is provided on this page. IISER IAT result 2018 contains the roll numbers of candidates shortlisted for the SCB first round allotment. Candidates who have qualified in the IISER Aptitude Test 2018 are required to download their offer letter and participate in the subsequent float round before the deadline. Applicants who will get qualify in IISER aptitude test will be able to secure his/her admission into 5 years, BS-MS Degree. Candidates must know that after the declaration of IISER result 2018 the seat allocation commence. The IISER result 2018 for IAT will be considered in 7 institutes such as IISER Pune, Mohali, Kolkata, Bhopal, Berhampur, Thiruvananthapuram, and Tripati. Candidates must go through the important dates related to IISER 2018 result. 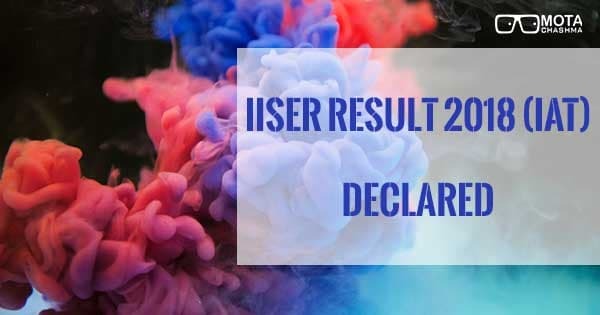 What is mentioned in IISER Result 2018? The IISER IAT result 2018 will contain the list of shortlisted candidates for the first SCB allotment round. The shortlisted candidates are required to participate in the Float round in order to complete the admission process. Also, after checking IISER result 2018, candidates must make sure that they download the offer letter.